Fruit will soon be growing on trees in many of Manchester's urban parks. The city council has a three-year plan to plant 20,000 fruit canes, fruit and nut trees and fruit bushes in all 135 of the Manchester parks. Residents will be able to pick the fruit, including strawberries, apples and raspberries as well as endangered fruits like mulberries and damsons. Vegetable patches are also planned and will be planted with potatoes, tomatoes, carrots and turnips. 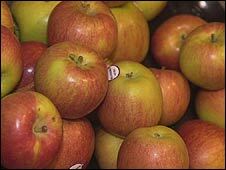 The council hopes the scheme will educate children in particular about where such produce comes from. Councillor Mike Amesbury, executive member for culture and leisure, said: "A local environmentalist approached us with the idea and we were immediately interested. "We have been amazed by how many children don't know where fruit and nuts come from so we see this as a useful educational tool and a wonderful community resource where people can literally help themselves." Information will be provided next to all the produce on how to tend it and when to pick it. The scheme will be managed by friends' groups and volunteers. Park wardens will also host workshops on tending and harvesting the plants. Debdale Park in Gorton and Platt Fields Park in Fallowfield already have apple, pear and plum trees in the grounds.